This isn’t original, I have read this somewhere nevertheless this serves to explain estimations, confidence interval and precision. 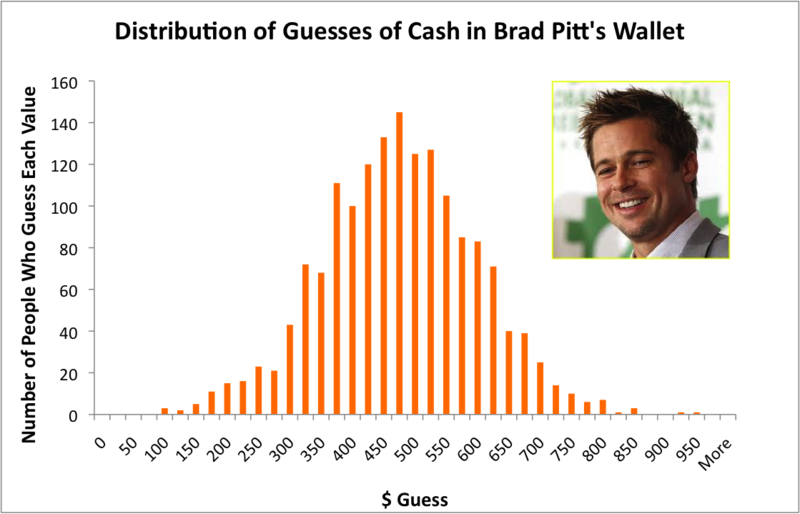 Suppose if I asked you to estimate how much cash does Brad Pitt carries in his wallet what would be your guess? It is hard to guess it right. It is hard because I asked you to give a single number and given that there are many possibilities (even with just whole numbers) your answer is likely going to be wrong. With you your guess of single value you cannot tell how confident you are about the estimate. That is the problem with making single value estimate – be it estimating cash in a wallet or expected revenue impact of a marketing campaign. Don’t give a single number and don’t trust anyone giving you a single number. What if we asked 1000 random people on the street to find all their answer and averaged it out. Would that give the right answer? Isn’t that wisdom of the crowd? Well it won’t be the right answer. But if you plot the answers and number of people who said each value on a graph (Histogram) you likely will see a Normal curve. The distribution will tell us the low and high value of the cash in Brad Pitt’s wallet and also the chance that it will be outside this range. Suppose 95% of the responses fall between $10 and $978 then we could say, “we are 95% confident Brad has $10 to $978”. Well we could be wrong in saying “we are 95% confident” if we received homogenous answers and hence got too narrow a range. Instead of asking 1000 people what if I asked you not for a single value but to give your 95% confidence interval for the amount of cash in his wallet, what would be your answer? It is the equivalent of asking 1000 different people. And since I asked for 95% confidence you should give a range so that there is only 5% chance the real answer is outside this range. I am not asking for precision (so don’t try to give a narrow range) but a high confidence level (so you should go wide). Since you do not know anything about cash carrying habits of Hollywood stars you should trade-off precision for confidence. You could answer, $0 and $100,000. That is acceptable but too wide a range to be of real use in cases other than estimating Brad Pitt’s wallet. However you can apply your knowledge about stuffing bills in a wallet and give a better range like $10 and $2000. That is what you would do when measuring outcomes of events when there are many unknowns. You break down the BIG unknown into a set of component unknowns and for each smaller unknown you make an estimate at a given confidence level. Stating a range with confidence level (confidence interval) based on application of prior knowledge is far better and usable than a single number that we are asked to trust. Which one of these two is more trustworthy? Summary:Great business model innovation that points to the future of unbundled pricing. But is Google customer survey an effective marketing research tool? Do not cancel SurveyGizmo subscription yet. When readers want to access premium content they can get it by answering a question posed by one of the brands instead of paying for access. Brands create surveys using Google customer surveys and pay per use input. Google charges brands 10 cents per response, pays 5 cents to the content creators and keeps the rest for enabling this three sided market. Business model is nothing but value creation and value capture. Business model innovation means innovation in value creation, capture or both. By adding a third side with its own value creation and capture Google has created an innovative three way exchange to orchestrate the business model. This also addresses the problem with unbundled pricing, mostly operational challenges with micro-payments and metering. But I cannot help but notice severe sloppiness in their product and messaging. Sample Size recommendation: Google recommends brands to sign up for 1500 responses. Their reason, “recommended for statistical significance”. Statistical significance has no meaning for surveys unless you are doing hypothesis testing. When brands are trying to find out which diaper bag feature is important, they are not doing hypothesis testing. What they likely mean is Confidence Interval (or margin of error at a certain confidence level). What is the margin of error, at 95% confidence level? With 1500 samples, assuming 200 million as the population size it is 2.5%. But you do not need that precise value given you already have sampling bias by opting for Google Customer Surveys. Most would do well with just 5% margin of error which requires only 385 responses or 10% which requires only 97 responses. Recommending 1500 responses is at best a deliberate pricing anchor, at worst an error. If they really mean hypothesis testing, one can use a survey tool for that, but it is not coming through in the rest of their messaging which is all about response collection. The 1500 responses suggestion is still questionable. For most statistical hypothesis testing 385 samples are enough (Rethinking Data Analysis published in the International Journal of Marketing Research, Vol 52, Issue 1). Survey of one question at a time: Brands can create surveys that have multiple questions in them but respondents will only see one question at any given time. With Google Consumer Surveys, you can run multi-question surveys by asking people one question at a time. This results in higher response rates (~40% compared with an industry standard of 0.1 – 2%) and more accurate answers. It is not a fair comparison regarding response rate. Besides we cannot ignore the fact that the response may be just a mindless mouse click by the reader anxious to get to their article. For the same reason they cannot claim , “more accurate”. Do not cancel your SurveyGizmo subscription yet. There is a reason why marketing researchers carefully craft a multiple question survey. They want to get responses on a per user basis, run factor analysis, segment the data using cluster analysis or run some regression analysis between survey variables. The system will automatically look for correlations between questions and pull out hypotheses. But I do not get what they mean by, “look for correlations between questions” and definitely don’t get, “pull out hypotheses”. It is us, the decision makers,who make the hypothesis in the hypothesis testing. We are paid to make better hypotheses that are worthy of testing. If we accept the phrase, “pull out hypotheses”, to be true then it really means we need yet another data collection process (from a completely different source) to test the hypotheses they pulled out for us. Because you cannot use the very data you used to form a hypothesis to test it as well. Net-Net, an elegant business model innovation with severe execution errors. What are the chances mom will be home when we arrive and what does this have to do with Pinterest revenue? Update: This article will help you understand my Gigaom guest post on Pinterest revenue: How much does Pinterest actually make? One of the games my 7 year old and I play while driving home from her school is guessing whether mom will be home when we arrive. Not bad for someone just learning enumerating the possibilities and finding the fraction. When we arrive home there is either mom or not. So 50-50 seem reasonable. But are the chances really 50-50? If not how would we find it? Well let us start with some safety and feel good assumptions, my drive time is constant, there is mom, she always leaves at fixed time and she will arrive. What is her mean drive time? What is the standard deviation of drive time? Assume that the drive times are normally distributed with the stated mean and standard deviation. It is then a question of finding, in what percentage of the scenarios the drive times show an earlier arrival time. That is the probability we were looking for and it is not 50-50 simply because there are only two outcomes. Here we did a very simple model. But who knows what the mean is let alone standard deviation. We do not. So we do the next best thing, we estimate. We do not literally estimate the mean and standard deviation but we estimate a high and the low value such that in 90% of the cases the drive time falls in that range. Stated another way, only 10% chance the drive time is outside this range. This is the 90% confidence interval.We are 90% confident the value is in this interval. Once we have this then it is more simple math to find the mean and standard deviation. Mean is average of the low and high values. 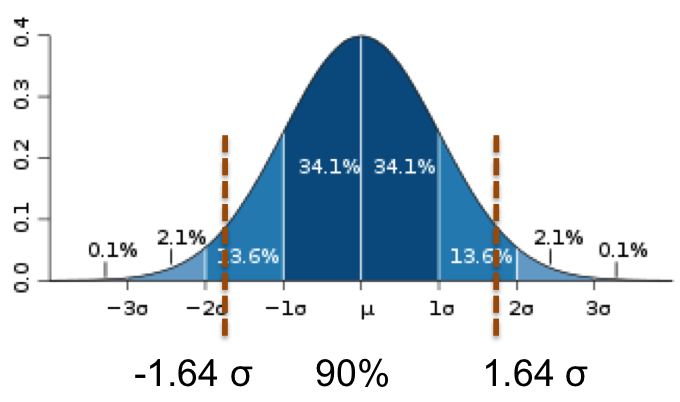 Standard deviation is the difference between high and low divided by number of standard deviations the 90% probability corresponds to in a standard normal curve (3.29σ). One you have the mean and standard deviation you can do the math to find the percentage of scenarios where drive time is below certain value. This is still simple. We treated drive time as the measurable quantity and worked with it. But drive time is likely made up of many different components, each a random variable of its own. For instance time to get out of parking lot, time to get on the highway, etc. There is also the possibility the start time is no more fixed and it varies. In such a case instead of estimating the whole we estimate our 90% confidence intervals of all these parts. In fact this is a better and preferred approach since we are estimating smaller values for which we can make better and tighter estimates than estimating total drive time. How do we go from 90% confidence interval estimates of these component variables to the estimate of drive time? We run a Monte Carlo simulation to build the normal distribution of the drive time variable based on its component variables. Once you have these 10,000 drive times then find what percentage of the scenarios have drive time less than certain value. That is the probability we were looking for. From this we could say, “there is 63% chance mom will be home when we arrive”. We could also say, “there is only 5% chance mom will arrive 30 minutes after we arrive”. When we know there is roadwork starting on a segment we can add another delay component (based on its 90% confidence interval) and rerun the simulation. That is the power of statistical modeling to estimate any unknowns based on our initial estimates and state our level of confidence on the final answer. Now what does this have to do with Pinterest revenue?